Gold Dot was the first handgun ammunition loaded with true, bonded-core bullets. Using an exclusive Uni-Cor® method, Speer bonds the jacket to the core one molecule at a time at the very beginning of the bullet construction process. This virtually eliminates core-jacket separation. With options for both standard handguns and short barrels, there’s a Gold Dot load to fit any shooter. Each Gold Dot hollow point cavity is tuned by specific caliber and bullet weight to ensure optimum performance. Speer forms the hollow point cavity in two stages. The first establishes how far the bullet can expand; the second controls the rate of expansion. This patented two-step cavity formation gives Speer engineers incredible control in the design process. Each bullet caliber and weight is tuned for optimum expansion and penetration. The bullet is then finished to provide a smooth profile for reliable feeding in semi-automatic handguns. 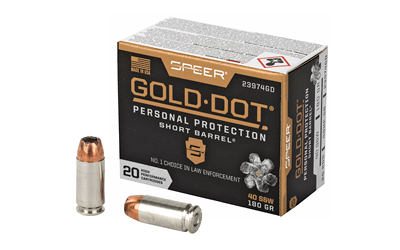 To ensure Gold Dot performs when you need it most, they first make sure it excels in the stringent tests developed by the Federal Bureau of Investigation for service-class handgun cartridges. These protocol tests evaluate penetration, expansion and retained weight in bare gelatin and gelatin shielded by common barriers.